As Illinois’ fiscal condition continues downhill, unpaid bill total nears $9 billion. The Ledger, a spreadsheet summary posted online by Comptroller Leslie Munger, now shows Illinois with almost $7.5 billion in unpaid bills. This includes not only the $3.68 billion in unpaid bills actually forwarded to the Comptroller for payment, but also an estimated $3.80 billion in past-due bills and invoices held at state agencies and not yet forwarded to the Comptroller. However, in testimony presented by the Comptroller to the Senate Appropriations I committee on Thursday, March 17, Munger described an additional $1.3 billion owed to vendors for statutory programs not covered by judicial process. Much of this additional debt is due to participants in state higher education and providers of social services. The $7.5 billion in conventional bills represent state programs, such as Medicaid, that are seen as legally essential and which continue to operate automatically under conditions of current continuing appropriations, consent decrees, and court orders. Additional bills of more than $1 billion represent programs that are dependent upon appropriated funding. Unpaid promises by the State, such as the college-oriented Monetary Assistance Program (MAP) grant program, fall into this category. In many cases, providers of services under these programs, such as providers of social services and institutions of higher education, have continued to operate through the first three-quarters of FY16 in the hopes that appropriations measures will be passed at some point and signed into law. When asked to add both categories of debt together, Comptroller Munger projected that the cumulative total budget deficit would top $10 billion by June 30, 2016. Obama administration turns down Illinois’ request for flood assistance. The response came almost three months after heavy rains and flooding events that began on December 26, 2015. In the following days, damage from high water was reported in 24 Downstate Illinois counties, with effects concentrated in (but not limited to) southwestern Illinois along the Mississippi River. Municipalities and property owners in Jersey, Madison, St. Clair, Monroe, Randolph, and Alexander Counties reported that buildings and other infrastructure were significantly damaged from the flooding. In many cases, damaged Illinois communities stood directly across the Mississippi River from equivalent Missouri communities that did receive federal disaster designation and assistance. However, the federal government’s use of a population-weighted threshold for determining assistance eligibility worked against Illinois’ application, with the Federal Emergency Management Authority (FEMA) saying that the same flooding event was scored differently with respect to the two states and their populations. The news from Washington was received on Friday, March 11. The Illinois Emergency Management Authority (IEMA) may try to appeal the decision. General Electric announces creation of new jobs in greater Chicago area. One hundred tech workers will staff GE’s new Digital Solutions office in central Chicago, and 60 additional positions will be created at the existing GE digital healthcare office in northwest suburban Barrington. New Chicago-area jobs totaling 160 are expected to be created as a result of the pair of moves by the global business firm, which is undergoing a series of administrative changes as it moves its overall world headquarters from Connecticut to Boston. General Electric has previously announced that it will move its overall healthcare headquarters from London to Chicago. The global business firm has many ties to Chicago, including its Chicago-based Transportation division; GE Transportation specializes in railroad locomotives and other transport solutions. New federal figures show wage increases in Lake County; medical industries credited. The figures, based on numbers tracked by the federal Bureau of Labor Statistics (BLS), compare quarterly wage rates over the wages paid in the same county twelve months earlier. In the third quarter of 2015, the most recent quarter tracked using this metric, wages grew in Lake County, Illinois by 11.7% from 2014-3Q to 2015-3Q. Much of the increase was attributed to a cluster of pharmaceutical, medical-device, and biotechnology research and headquarters operations in Chicago and it northern suburbs. Abbott Laboratories, AbbVie and Baxter International are all headquartered in Lake County. Walgreens, one of the world’s largest pharmaceutical retailers, is also headquartered in the region. While few overall net new jobs were being created in Lake County during this period, BLS figures indicate that these and other private-sector business firms were focusing their Chicago-area operations in the direction of pay grades related to greater worker specialization, professionalization, and qualifications-related job positions. County Board Chairman Aaron Lawlor complimented a growing trend among local businesses to cooperate with local colleges and universities to develop job-related, semi-professional, and professional business skills. Household income in Lake County averages $80,000, the highest income level among Illinois’ 102 counties. Students begin taking state-mandated achievement test for 2015-2016 school year. The Partnership for Assessment of Readiness for College and Careers (PARCC) is a standardized test of English language arts and math that is given to students in Illinois public school districts. The assessment is designed to measure student performance under the Common Core Standards. Students and test supervisors must undergo the testing procedure during a state-mandated “window” of time. This year’s PARCC testing window began on March 7 and will end on June 10. Numbers generated by the test results will be reported to Springfield and, after scrutiny, will be re-released to each Illinois school district and each school as an assessment of the school’s overall performance. The 2015-2016 school year is the second annual cycle in which the controversial assessment test has been administered statewide. The Illinois State Board of Education (ISBE), which supervises implementation of the PARCC testing mandate, has stated that they plan to speed up the scrutiny period this year so as to allow for quicker re-reporting of results to individual school districts and schools. Prompter reporting of results could result in effective changes in the curriculum and policies implemented in Illinois public schools in the 2016-2017 school year in response to test results. One reason for the unpopularity of the PARCC assessment test in some quarters has been the relatively high level of poor results released by the ISBE to many Illinois school districts following implementation of the PARCC testing cycle in 2014-2015, as well as the number of hours students were required to dedicate to the test. On a statewide level, test results were deemed to indicate that only one-third (33%) of Illinois public school students taking the test were deemed as “meeting or exceeding expectations.” The ISBE has stated that the PARCC test-taking protocol to be imposed on students this year will include a shorter, simplified test taking format, which may allow some students to show results that indicate greater functionality than in the controversial test’s inaugural Illinois year. As spring driving season approaches, gas prices soar in Illinois. The average price per gallon charged for motor fuel increased 18 cents during the week ended Monday, March 14. Statistics compiled by the motor fuel website GasBuddy.com indicated that during this period the price of gas rose from $1.88 per gallon to $2.06 per gallon. This marked the second highest increase for the week among the 50 states, with prices rising 19 cents per gallon in neighboring Missouri. Illinois gas prices were 12 cents per gallon higher than the nationwide average of $1.94 per gallon. Gas prices tend to be higher than the national average in Illinois because of relatively high tax rates, particularly in the Chicago area. People who buy gas within Chicago city limits must pay separate slices of tax to the federal government, the State of Illinois, the Regional Transportation Authority (RTA), Cook County, and the city of Chicago. The State of Illinois charges separate taxes upon motor fuel by the gallon (Road Fund excise tax) and by the dollar (General Funds sales tax). As recently as August 2012, gas cost an average of $4.31 per gallon in Chicago. Mahomet Aquifer provides drinking water for 800,000 Illinois residents. The Mahomet Aquifer underground waterflow, buried in past Ice Ages, serves a wide variety of rural and small-town residents of eastern and central Illinois. Most of the aquifer is hidden from the public, with only a few surface outcroppings visible in the form of water towers of pumping stations that rely upon the aquifer for their water supply. The traditionally clean water of the aquifer could be affected by increasing uses of the soil above it for landfill and chemical usage, including PCB chemicals. In response to concerns raised by Central Illinois families, water authorities, and Republican lawmakers, the Illinois Environmental Protection Agency has announced plans to increase the ongoing and continuous monitoring of the aquifer. Test wells will be drilled and samplings will be taken adjacent to existing, operating landfills. Champaign, DeWitt, Ford, Iroquois, Logan, McLean, Mason, Piatt, Tazewell, and Vermilion Counties are among the counties whose residents get their drinking water from the aquifer. HB 1326, signed into law in August 2015, represents work by the General Assembly to protect the Mahomet Aquifer from potential landfill pollution. GOP lawmakers want House to get back to work. 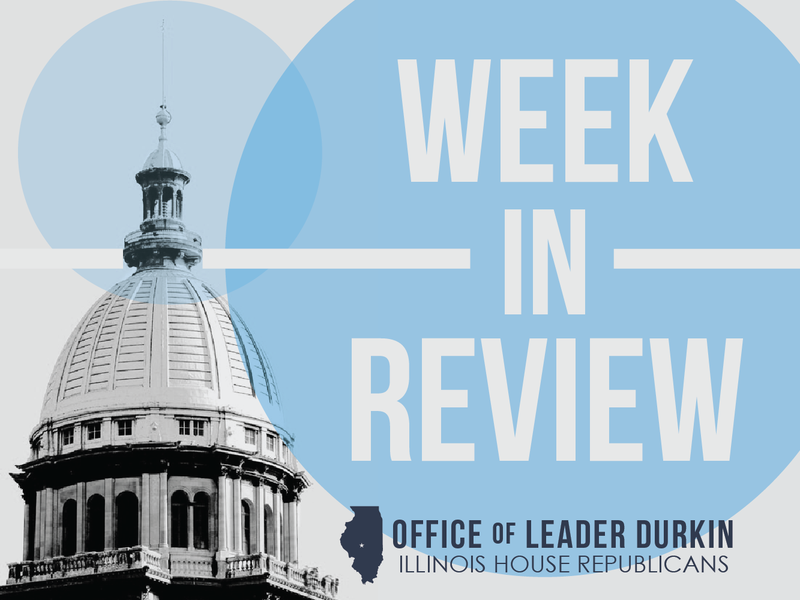 With the Illinois House of Representatives in the midst of a month-long break, a group of Downstate GOP lawmakers want the House to return to session to work on a compromise to end the nine-month long budget impasse. State Representatives Bill Mitchell, C.D. Davidsmeyer, John Cavaletto, David Reis and Avery Bourne held a press conference in Decatur Wednesday to urge Democrat leaders to call the General Assembly back into session. “The sad fact is Illinois is broke. Our colleges, students and human services are suffering because of the Chicago politicians’ refusal to compromise on desperately-needed economic and spending reforms. We are nine months into Fiscal Year 2016 without a budget and the House has only been in session nine days this entire year. What are we doing? Speaker Madigan needs to end this month-long break and get back to work,” said Rep. Bill Mitchell. 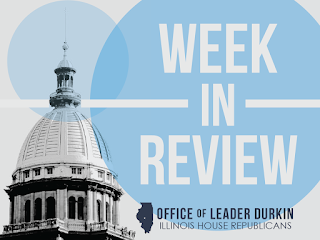 Illinois House Republicans, furious about the lack of a state budget and seemingly empty session calendar thus far this year, challenged House Democrat leadership to not adjourn as scheduled for the month of March. At the conclusion of the House session on March 3, Republicans made a motion to bring the legislature back the following day. Despite being completely in line with the House Rules, the motion was ruled out of order, with Democrat leadership scurrying quickly from the chamber to prevent debate on the issue. House Democrats cleared out of the chamber despite the requests from Republicans to keep working. "The Speaker's scheduled month-long 'spring break' amounts to a complete dereliction of duty, especially while kids wait for needed college funding and seniors go without needed help. I continue to ask the Speaker to find the will to come together to compromise for the future of all Illinoisans,” said Rep. C.D. Davidsmeyer. “Our universities and community colleges are paying a steep price for the Speaker’s blatant disregard of his constitutional duties. EIU, WIU and SIU are all laying off employees, cutting back on course offerings, and many students are facing a grim future without financial aid. We filed legislation in January to fund higher education and MAP grants. Unlike the Democrats’ sham spending bills, our plan actually has a funding source. Let’s go back to Springfield, get back to work and pass a real plan to fund higher education,” said Rep. David Reis. “Our people are hurting. Unemployment is high and good-paying jobs have disappeared. Working families can’t afford to send their kids to college. Instead of working together to address these problems, Speaker Madigan and his Chicago allies decided to take a nice long vacation. We need a budget that works for our families, communities and state. Enough delays, enough stalling, enough political games. Let’s get this done,” said Rep. John Cavaletto. “I and my colleagues are here ready to work. Unfortunately Speaker Madigan is not. It is time to stop playing political games with the future of Illinois and pass a balanced bipartisan budget,” said Rep. Avery Bourne. The Downstate GOP lawmakers sent a letter to Speaker Michael J. Madigan requesting that he and Senate President John J. Cullerton call the General Assembly back into special and/or continuous session to deal with the ongoing budget crisis. Article IV, Section 5 of the Illinois Constitution states that special sessions of the General Assembly may be convened by joint proclamation of the presiding officers of both houses. As legislators are entitled to a per diem of $111 for special session days, the GOP lawmakers have pledged to not accept per diems for any special session days called for budget purposes. Southern Illinois University (SIU) joins list of state universities facing sharp cuts. The Southern Illinois University system includes three main campuses. The system includes two full-service university campuses serving Southern Illinois communities, located in Carbondale and Edwardsville, and one medical school campus in Springfield. Like other state universities, SIU has undergone sharp cutbacks in funding as the result of the FY16 budget impasse and could face similar or even more severe cutbacks in FY17. Southern Illinois University President Randy Dunn has laid out cuts and layoffs at all three campuses that might be required under the current fiscal crisis. Encompassing a total of 420 faculty and staff positions, the projected layoffs include 180 positions in SIU’s main campus in Carbondale, nearly 140 jobs in Edwardsville, and 100 positions at the School of Medicine in Springfield. New leadership teams at Office of the Governor, State Fairgrounds call for attention to State Fair infrastructure. The Governor’s office, which is in charge of working with the General Assembly to allocate the State’s limited supply of capital spending funds, released a report this week listing $180 million in unperformed repairs and maintenance required for continued use of the Illinois State fairgrounds in Springfield and DuQuoin. Unperformed tasks include roof repairs, electrical rewiring and repair, and road repaving. Several buildings have not enjoyed active upkeep work in more than 20 years. The report’s findings match previous discoveries by the Rauner administration of substantial unperformed state repair/maintenance work at facilities, such as the James R. Thompson Center state office building in Chicago, and on state roads and highways throughout Illinois. In the case of the Thompson Center, the accumulated burden of unperformed maintenance has led to a recommendation that the State consider closing down the building and selling the valuable real estate to the private sector. The Rauner Administration has previously begun to name new managers for the Illinois State Fairs. A new Springfield-based assistant state fair manager was hired in February. As State fiscal crisis worsens, procurement reform could save more than $670 million. The savings from modifications to the Illinois Procurement Code, the law that governs how Illinois and its state universities are required to purchase goods and non-specialty services, would come from speeding up the process and creating a new class of pre-cleared bidders who could compete in future Requests for Proposals (RFPs) without time-consuming verifications. After studying the operation of the existing Procurement Code, the Rauner Administration released the results of a preliminary study in February, which indicated that the enactment of a package of reforms could generate as much as $514 million in procurement savings to be enjoyed directly by the State of Illinois, with additional savings of $159 by state universities. Reforms advocated by the Governor include a preclearance process and the creation of a new position of state chief purchasing officer (CPO) in a personnel move that would mirror the organizational table of many large private-sector enterprises and firms. Warmer weather brings first confirmed tornado to Illinois. With the coming of spring to Illinois comes the possibility of dangerous storms. A squall line passed through the Prairie State late Tuesday, March 15, and several tornadoes briefly touched down. For example, one twister landed in rural McDonough County in west-central Illinois. None of the storms caused reported injuries. In addition to potentially catastrophic tornadoes, the squall line or “derecho” generated gale-force winds and damaging hail. The Illinois Emergency Management Agency (IEMA) has prepared a fact sheet on severe weather preparedness for Illinois families. Weather alerts, tornado watches, and tornado warnings are familiar to Illinoisans, but newcomers to the Land of Lincoln should familiarize themselves with them. An increasing number of cellphones are technologically connected to Specific Area Message Encoding (SAME) warning-message systems that automatically generate a unique tone signal and warning message when a severe weather warning, such as a tornado warning, is issued for a specific time and place. Illinois residents who do not subscribe to cellular phone service, or who are out of range of the existing warning network, are strongly urged to obtain a weather alert radio that will automatically emit a parallel warning tone when a weather hazard is detected. IEMA has announced plans to hold a random drawing to award 100 free weather alert radios to Illinois residents. Participants in the drawing are asked to submit applications no later than March 31.